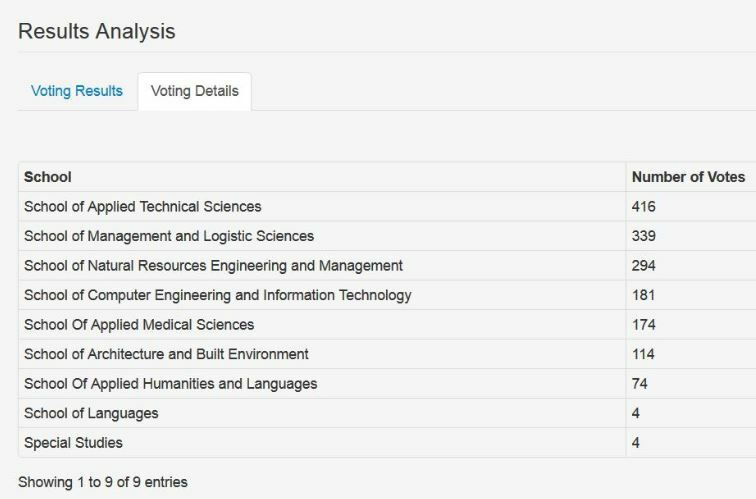 The web-based voting system was developed to enable the student body of German Jordanian University (GJU) to elect their representative in the university council, which is the highest council in determining the university’s strategic directions. The latest fully online elections took place on Dec 20th, 2016, allowing 1600 of the university students including those in Germany to electronically cast their votes to select the strongest forerunner candidate. It is worth mentioning that this is the second successful electronic elections at GJU, which puts GJU in a pioneering position compared to other universities in this regard. This would have not been possible without the help of the staff of ISTC in specifying and designing the voting system - Dr. Feras Al-Hawari, implementing the web-based voting system - Eng. Hala Barham, administering the system’s database and web server - Eng. Wael Srarheh, securing the network and setting up the virtual machines - Mr. Khalil Hanbali, and none the less the technical support engineers for helping the students in resetting their GJU E-mail passwords.